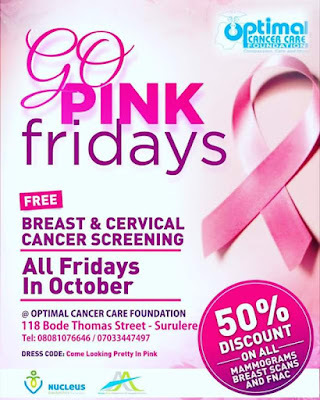 Optimal Cancer Care Foundation (OCCF) in partnership with Sponsors and Donors and two major diagnostic centres in Lagos: Nucleus Diagnostic Centre and Arrive Alive Diagnostic Centre are bringing to you massive 50% discounts on all Breast ultrasound scans, mammograms and FNAC tests and of course, free clinical breast examinations at the Foundation’s screening centre. 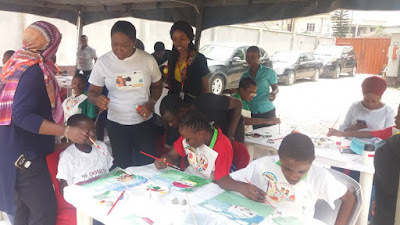 OCCF is known and recognised worldwide for its philanthropic fight against the dreaded cancer that has sent many women and girls to early grave. 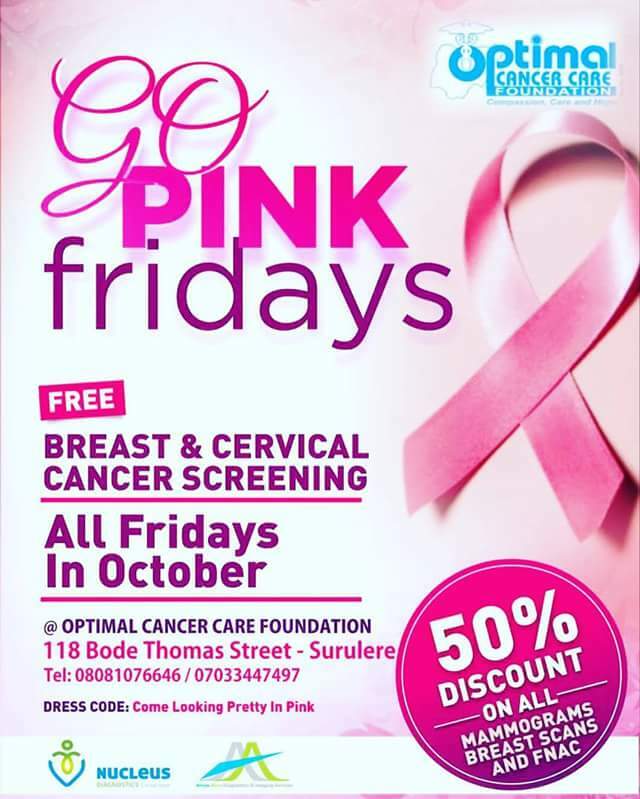 Today, however, "October is #breastcancerawarenessmonth - a time where we all join forces to reduce the burden of breast cancer in Nigeria and across the globe," Dr. Olaleye said. On what to do to get screened, he urged all to drive to the foundation looking #PrettyInPink 💕💕💕 on any of the Fridays in October. The foundation is sited at 118 Bode Thomas Street, Surulere Lagos. Remember: "Early detection is key". "Have a wonderful day and don't forget to share with all the women you care about."